Welcome to the Driving For Dollars App! The Revolutionary Real-estate Direct-Mail Scouting App! 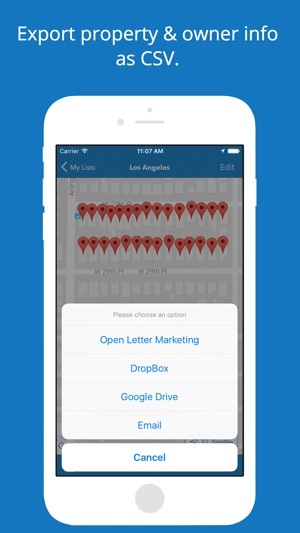 If you know that Direct Mail Marketing is vital to your businesses success and you find yourself driving neighborhoods to find potential business, then the Driving For Dollars App is for you. The D4D App eliminates all the work needed to determine homeowners and where they can be mailed in order to better market to them through direct mail. The term “Driving For Dollars” was coined in the real estate investing world, which means to drive neighborhoods in order to find lucrative deals for your business. We developed this App for Real Estate Investors trying to find deals, Realtors looking for listings, or Tradesman looking to market their businesses in specific neighborhoods. 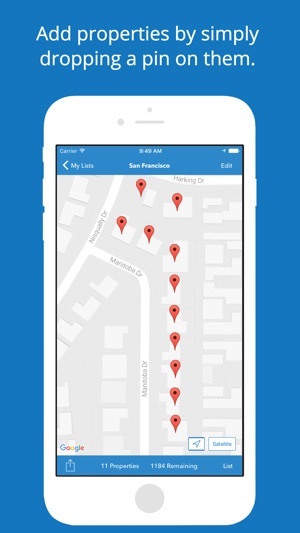 If your goal is to drive neighborhoods and direct mail market to homeowners, then this app will eliminate all the back-end work of finding who the homeowner is and where to send them mail. For many, this means eliminating hours of work or eliminating the expense of having an employee do this work for you. The D4D App is integrated with a major data provider to give you the latest, public information you seek and then exports your lists into an excel spread sheet so you can easily mail merge your marketing letters. The user interface allows you to speak the address into the app, type in an individual address, or drop pins on specific properties in the overhead map view. 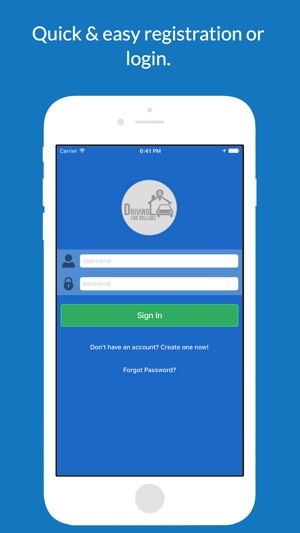 The Driving for Dollars App offers a monthly subscription option. See additional details below. A $34.99/month purchase will be applied to your iTunes account upon confirmation of purchase. Subscriptions will automatically renew unless canceled within 24-hours before the end of the current period. You can cancel anytime within your iTunes account settings. Any unused portion of previously purchased consumable products or free trial will be forfeited if you purchase a subscription. 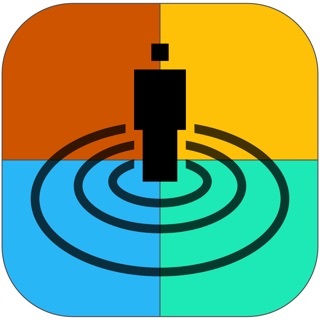 • Improved location accuracy when dropping pins. 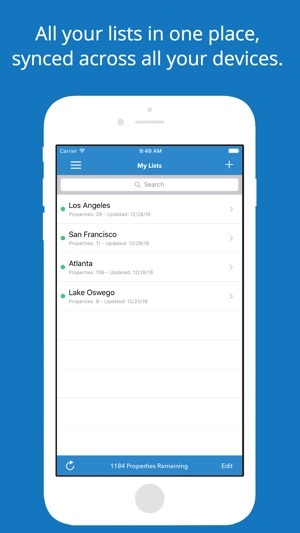 You'll now get a more accurate address when building your lists. • Tons of performance improvements! Seriously, the app now performs much quicker than before. • New CSV exporting functionality to make it much easier to export your lists. • Squashed some pesky bugs. This app will simplify your driving for dollars significantly. Being able to just drop pins, save the list, and get the information you need to contact homeowners is incredible. No need to sit in front of a computer for hours trying to drag the info out of 10 different websites. But...you have to actually click “save” when you’re done with your trip as another disgruntled user posted, or you will lose your pins. This is no different than any other iOS app, in my opinion. Drop your pins, click save, get your list. It’s that easy. Totally worth the money. This app helped jump start my house flipping business. 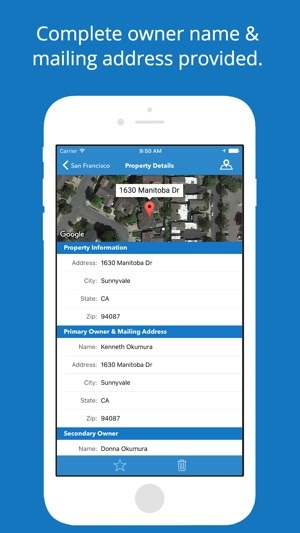 The ability to pin any address while driving (or even at home) and export all homeowner data to Excel does more than just save you time and money. The functionality is incredible and is so user friendly. Since downloading this I’m pumping out twice as many mail campaigns with ease, my leads are better quality and volume has picked up. Investor interest has also increased bc the deals I’m getting are mostly exclusive. If you’re in this business to make money...don’t be stupid, use the app! Decided to give this app a go. Marked some properties (3)down in my neighborhood. Worked fine for the test. Put it to work in the field. Ran across some properties that were great leads and pinned them. Got back home to find that I had 0 properties in my list. Even the three that I’d saved just to learn how the app works! Completely dissatisfied with this app that’s supposed to make life easier and remove a lot of the grunt work. I’ll be requesting a full refund and trying out some other alternatives. I will not get back the two and a half hours spent looking for these deals. Instead I’ll need to go back to those same neighborhoods a second time looking like a creeper, for the sake of damage control.